We are a member of the Evangelical Covenant Church. The Covenant Church is a non-creedal church, meaning that we have no formal or official doctrinal statement that defines us or that we require people to believe in order to belong. That being said, we affirm both the Apostle's Creed and the Nicene Creed and see ourselves as a part of God's universal church while maintaining the freedom to "agree to disagree" in order to preserve the unity of the body. St. Augustine famously said, "In essentials, unity; in non-essentials, liberty; in all things, love". It is this spirit that we seek to maintain as a Covenant people. We are a member of The Alaska Conference of the Evangelical Covenant Church. The Alaska Conference is the regional grouping of Covenant churches (much like a conference) and is comprised of 22 churches, most of which are located in the remote villages of Western Alaska. First Covenant Church seeks to be a place where everyone is a welcome member of the family of God. We are multi-ethnic. We are primarily Alaska Native (Inupiaq, Yupik & C'upik) & Anglo (or white) - and we are usually roughly half of each - but that does not define all who call First Covenant home. As is the case in most places, many people of different heritages find themselves inside our walls and we are grateful for all who enter. We are multi-generational. We are a 53 year old church and are in an exciting season of growth. We have a strong contingent of every age group, from the youngest of children to college students, to the middle-aged and elders. We come from different places. We are located on the edge of downtown Anchorage and are therefore an urban church, but people come from all over to be a part of this body. At First Covenant, you will find those who have much and those who have little worshiping side by side. You will find city folk worshiping with rural folk worshiping with suburbanites. Like the hub of a wheel, we aim to be a church that supports and encourages the other Covenant churches of Alaska - especially the churches of Western Alaska. 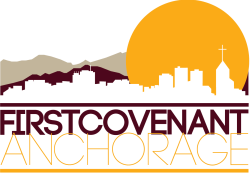 First Covenant Church was planted in 1961 to be a Covenant church in Anchorage for the Covenant people of western Alaska. Many times people have to come to Anchorage for all sorts of reasons (work, hospital visits, college, shopping, etc.) and one of our main goals is to be a home away from home for those who find themselves here, whether for a season or for good. For more about what we believe, please click here.